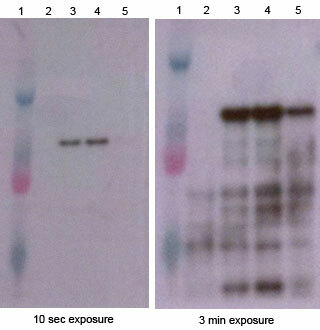 Western Blot: Shown are the results of WB on protein extracts from untransfected (A) and transfected (B) HEK293 cells using the Anti-CRISPR-Cas9 mAb. Immunofluorescence: Hela cells were transiently transfected with an N-terminally Flag-tagged S. pyogenes Cas9 expression vector. The cells were stained with the Anti-Cas9 monoclonal antibody followed by anti mouse-AF488 coupled secondary antibody. Nuclei were counter-stained with Hoechst 33342. The discovery of CRISPR (Clustered Regularly Interspaced Short Palindromic Repeats) and Cas9 (CRISPR associated system or CRISPR associated protein 9 nuclease) found in bacteria to work as a defense mechanism against foreign DNA has proven to be an invaluable tool to target and modify a genetic sequence in gene editing and genome engineering applications. The system, known as CRISPR/Cas9, allows for sequence-specific cleavage of a targeted genomic locus by delivering the RNA-guided nuclease (Cas9) and appropriate guide RNAs (gRNA) into a cell. In addition, Protospacer Adjacent Motif (PAM) sequence immediately following the specificity sequence is necessary for successful binding of the Cas9 nuclease. Mouse monoclonal antibody raised against CRISPR/Cas9, clone 7A9, generated with synthesized peptide corresponding to sequence of Streptococcus pyogene (S. pyogenes) CRISPR-associated endonuclease Cas9/Csn1. This Anti-Cas9 mAb can detect CRISPR/Cas9 expression in target cells by WB, IF, IP, or ELISA to confirm and verify whether gRNA and Cas9 vectors are successfully transfected. Recombinant N-terminal fragment of S. pyogenes Cas9 protein expressed in E. coli. Store at 4°C for short term (1-2 weeks). For long term storage, aliquot and then store at −20°C. Avoid multiple freeze/thaw cycles. Ajina R. et. al. et. al. (January 2019). SpCas9-expression by tumor cells can cause T cell-dependent tumor rejection in immunocompetent mice OncoImmunology. Rossidis AC et. al. (October 2018). In utero CRISPR-mediated therapeutic editing of metabolic genes. Nat Med. 24(10):1513-1518. Yarrington RM et. al. (September 2018). Nucleosomes inhibit target cleavage by CRISPR-Cas9 in vivo. Proc Natl Acad Sci U S A. 115(38):9351-9358. Shane G McInally et al. et. al. (June 2018). Robust and stable transcriptional repression in Giardia using CRISPRi bioRxiv. Ophinni Y et. al. (May 2018). CRISPR/Cas9 system targeting regulatory genes of HIV-1 inhibits viral replication in infected T-cell cultures. Sci Rep. 8(1):7784. Haitao Chen et. al. (March 2018). Efficient genome editing of Magnetospirillum magneticum AMB-1 by CRISPR-Cas9 system for analyzing magnetotactic behavior bioRxiv. Behler J et. al. (March 2018). The host-encoded RNase E endonuclease as the crRNA maturation enzyme in a CRISPR-Cas subtype III-Bv system. Nat Microbiol. 3(3):367-377. Hu J et. al. (February 2018). A Non-integrating Lentiviral Approach Overcomes Cas9-Induced Immune Rejection to Establish an Immunocompetent Metastatic Renal Cancer Model Molecular Therapy - Methods & Clinical Development. 9(2018):203-210. Li S et. al. (September 2017). One-Step piggyBac Transposon-Based CRISPR/Cas9 Activation of Multiple Genes Mol Ther Nucleic Acids. Chew WL et. al. (September 2016). A multifunctional AAV-CRISPR-Cas9 and its host response. Nat Methods. Fuller KK et. al. (August 2015). Development of the CRISPR/Cas9 system for targeted gene disruption in Aspergillus fumigatus. Eukaryot Cell. Wang D et. al. (June 2015). Adenovirus-mediated somatic genome editing of Pten by CRISPR/Cas9 in mouse liver in spite of Cas9-specific immune responses. Hum Gene Ther. Western Blot detection of Cas9 protein expression in A. fumigatus Af293 transformed strains. 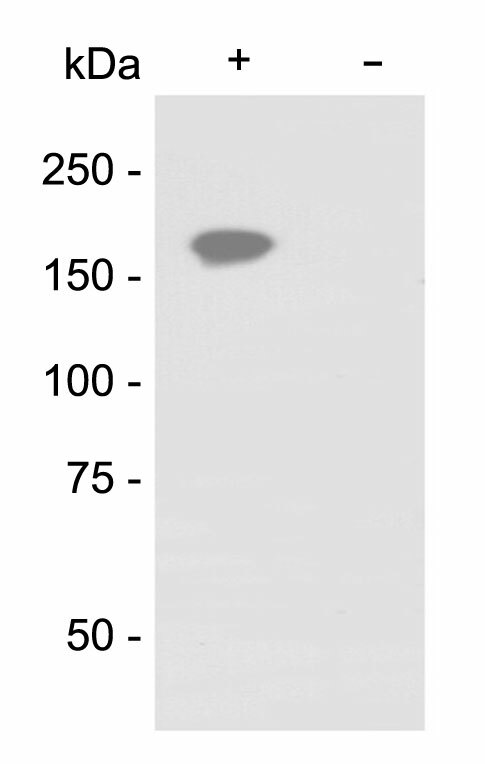 For this membrane, I used 1:500 dilution of the Cas9 mAb in blocking buffer (0.1% PBST with 5% non-fat dry milk) and incubated the membrane overnight at 4 C. For my secondary antibody, I used 1:3000 dilution of goat anti-mouse IgG(H+L) HRP-conjugated antibody (Bio-Rad). Cas9 protein is the dominant signal when Cas9 is under a constitutive promoter. The 10 s exposure is quite clean, and I overexposed it to get a sense for what other non-specific proteins the Ab might be binding to.